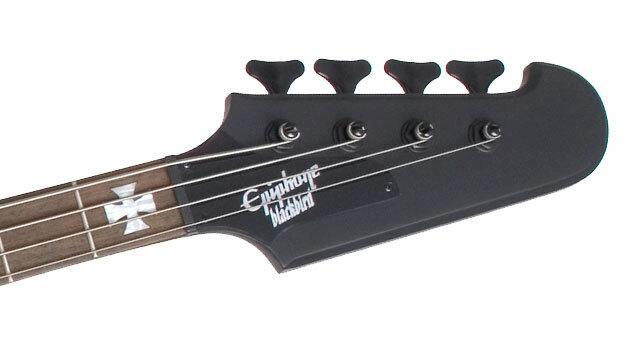 If you love your music louder than Hell, Epiphone's Nikki Sixx Blackbird electric bass guitar is the axe for you. Together with our Epiphone’s design team Mötley Crüe’s Nikki Sixx re-imagined the 1963 classic from a rock and roll stand-by into a dark bird of the future. Like all of our instruments, the Nikki Sixx Blackbird comes with our Limited Lifetime Warranty and Gibson 24/7/365 customer service. Visit your Authorized Epiphone Dealer today and soar with a Nikki Sixx Blackbird from our bass collection. The Blackbird features a mahogany body and a 34” scale bolt-on hard maple neck with a rosewood fingerboard with pearloid Iron Cross inlays and a 1.50” nut radius. The body is finished in fabulous Pitch Black (PB) satin. The Blackbird’s foundation-shaking tone comes from 2 DeepSixx humbucker pickups which give the bass a thunderous output, especially since they are wired direct and have an on/off toggle as their only control. There's no volume knob! This Blackbird is either full on or turned off. Another innovative feature is the Opti-Grab™ device, which lets you solidly anchor your hand while picking at the bridge to get that hard drive. 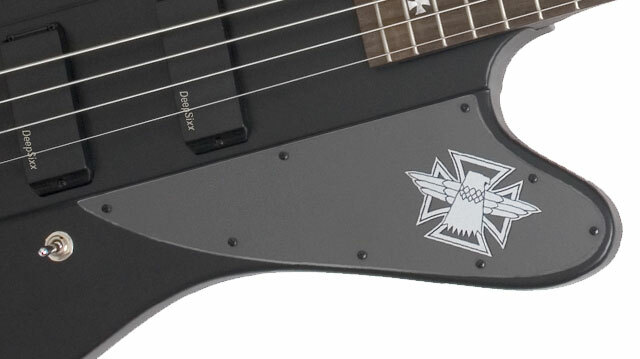 The pickguard also features a unique cross over-lay with a classic Thunderbird logo. The Nikki Sixx Blackbird features all-metal black hardware, black premium die-cast 17:1 machine heads, and an Epiphone classic 3 point adjustable tailpiece, the very same that Nikki plays on stage.